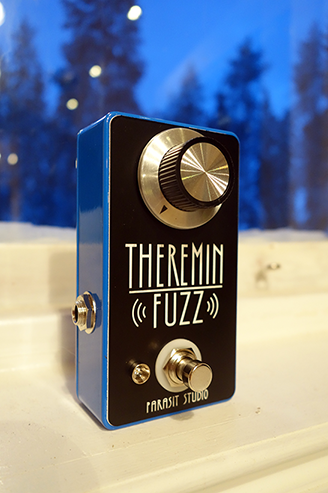 The Theremin Fuzz is a guitar effect that produces a sound similar to a real theremin instrument, but controlled with the input from your guitar. Just like the ITU Guitar Synth this one uses a PLL VCO (Voltage Controlled Oscillator) for the main sound, but in a much smaller and easier to control format. This was developed basically per request, as many people has been asking for the theremin sound of the Into the Unknown, but in a smaller version with not too many knobs. However, this one sets itself apart from the Into the Unknown alittle because it can do unity octave (the ITU only goes one or two octaves higher). It creates a cool layered sound when blended with the straight square wave fuzz. This is the perfect pedal for freaky retro space and horror effects!